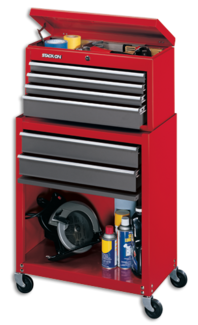 Large, full width drawers are designed for storing larger tools. Rugged all-steel double wall construction for greater strength. 2-drawer roller cabinet with large bulk storage area. Top chest fits inside the large compartment of the cabinet for shipping and merchandising. Available in black (SCBLK-600) or red (SC-600) gloss finish.